Best online custom tailored suits and clothing with FaceTime sizing: Most of e-commerce custom suit makers require only self-measured measurements from customers. However, measurement guide instructions alone are not enough to measure accurately. Most definitely, incorrect outcomes can occur from inexperienced measuring skills. A quarter inch could make a huge difference for a perfect fit. Unlike other major e-commerce custom suit makers, Stephén Seo and team offer FaceTime Sizing™, which is a crucial guideline for customer’s self-measurements. With over 15 years of experience, along with video conference call sizing, we are extremely confident that we will deliver successful outcomes to all of our customers. We are proud to introduce, FaceTime Sizing™! Once your measurements have been completed with our FaceTime Sizing™, we will keep the customers’ measurements in our system, allowing them to simply choose “use my existing size” for their next purchase. The Measure of Confidence! Looking forward to meeting you through FaceTime Sizing™. Stephén Seo is a bespoke brand that specializes in custom tailored clothing for the most distinguished of tastes. An oasis for fashionistas and curious sophisticates alike, this custom tailored clothing brand is known for whimsical shirt patterns, meticulously detailed suits, Italian bespoke handmade ties, pocket squares and bespoke handmade shoes. In addition, Stephén Seo designs cocktail dresses, stunning silk blouses, and skirts, as well as 100% cashmere overcoats and trench coats for both men and women. All fabrics are sourced from Italian, English, French, Belgian, and Scottish trends. Bent on restoring the tradition of creating handmade clothing for each unique client, Stephén Seo has become synonymous with clean silhouettes and remarkable fabrics. Stephén Seo’s custom made products are available on our E-commerce website (stephenseo.com) After checkout, you will be able to make a video conference call appointment for your body measurements. Mr. Seo, himself and team, will assist customers to measure accurately through Facetime or Skype. 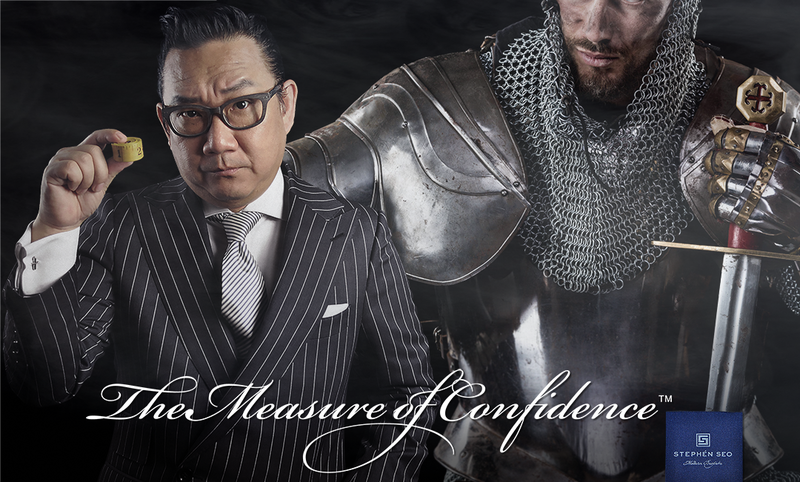 The Measure of Confidence! Stephén Seo custom suits have been featured on A-list celebrities and Hollywood projects, including Showtime’s White Famous, HBO’s Entourage and Entourage the Movie. He also has been featured in high-end luxury magazines such as Departures, Robb Report and New York Times to name a few.